Former presidential candidate Mir Hossein Mousavian addresses a cheering crowd during the protests following Iran’s disputed 2009 presidential election. 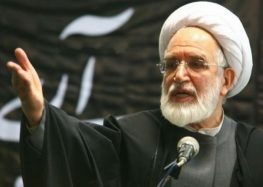 In an open letter addressing Muslim religious leaders worldwide, Mir Hossein Mousavi’s daughters have accused “some” Iranian officials of “hoping and planning” for the “gradual death” of their father, mother Zahra Rahnavard, and fellow opposition leader Mehdi Karroubi. Mousavi (75), Rahnavard (72) and Karroubi (80) have been under extrajudicial house arrest and forced isolation for more than six years for leading the peaceful protests against the disputed result of Iran’s 2009 president election. Mousavi’s daughters, Kokab, Zahra and Narges Mousavi, said they are only permitted to see their parents once a week at their home on Pasteur St. in Tehran. No one else is allowed to enter the home without approval by the security agents. “Some are hoping and planning for the gradual death of the detainees while others see it as an easy solution for this inescapable problem,” wrote Mousavi’s daughters in a letter published on October 15, 2017, on the reformist Kalame website. “We, the daughters of Zahra Rahnavard and Mir Hossein Mousavi, address you at a time when we have been witnesses to injustice against our parents under house arrest for nearly seven years,” they wrote. Activists and MPs renewed calls for the elderly opposition leaders to be released after 79-year-old Karroubi was repeatedly hospitalized in the summer of 2017 to receive emergency treatment for heart complications, including low blood pressure. According to comments by officials familiar with the case, Supreme Leader Ali Khamenei has long insisted that the three must apologize for their role in the peaceful mass protests of 2009, which were violently repressed by the state. On August 29, 2017, agents of the Intelligence Ministry, who had been stationed inside Karroubi’s home in the Jamaran neighborhood of northern Tehran from the beginning of his house arrest, retreated after he went on hunger strike to demand their exit. However, the opposition leader’s second demand, to be tried in public, was ignored. “They are lingering in a hopeless situation that is not only unlawful, but also un-Islamic and inhumane, they have been left at the mercy of vengeful people seeking power,” they added. A day after the letter was published, Grand Ayatollah Yousef Sanei, an outspoken moderate religious leader in the city of Qom, condemned the house arrests. “The officials are busy fighting over power and don’t care about the people’s problems,” said Sanei in an interview with Kalame on October 16, 2017. Ending the house arrests was one of President Hassan Rouhani’s top pledges during his 2013 election campaign. Crowds of supporters chanted for the trios’ freedom during many of his campaign rallies in 2013 and again in 2017. However, after his re-election on May 19, 2017, Rouhani adopted a more cautious line and suggested that a solution depends on cooperation from other branches of state.